The State University of New York’s (SUNY) College of Environmental Science and Forestry (ESF) had its work cut out when it took ownership of the Adirondack Interpretive Center (AIC), an outdoor science and educational center, two years ago. “The AIC had no budget or staff. We had to incorporate it into our own educational outreach, using existing budget,” says Paul Hai, program coordinator at ESF’s Newcomb campus, where AIC is located. He knew some sort of creative fundraising was needed to support this newest addition to SUNY’s environmental education and outreach efforts. “I wanted to do something different and creative,” says Hai. He came up with the idea of a duck race, given the facility’s location on a stretch of Rich Lake, which formed a natural racecourse. Two bridges comprised a perfect start and finish line for the race, which would also help commemorate the Adirondacks’ history of spring log drives on the lake, which took place annually in the early 1800s to mid-1900s. 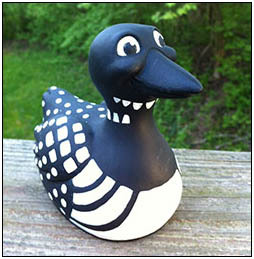 Rather than using typical rubber ducks, Hai wanted to float rubber loons, aquatic birds that are a beloved symbol of the Adirondacks. Also, he wanted the loons to be USA-made to further connect the event to the local environment. “Many people come to the Adirondacks just to see the loons,” Hai says. He never expected that it would be so difficult to find rubber versions. He was finally able to locate a promotional products company that could supply him with custom-made ducks.